MK – SK/MK did a Traidcraft stall for the Keep Fit Association on 13th Oct and made £98.60. Not high sales but helps our profile. SK – Had another Traidcraft stall Christ the Servant King church last Sunday and took over £500. Traidcraft are ceasing to be a PLC at the end of the year. JM – They are going into administration. MK – They may morph into something else. Waiting for something more concrete. JM – Has heard that various options are under consideration. 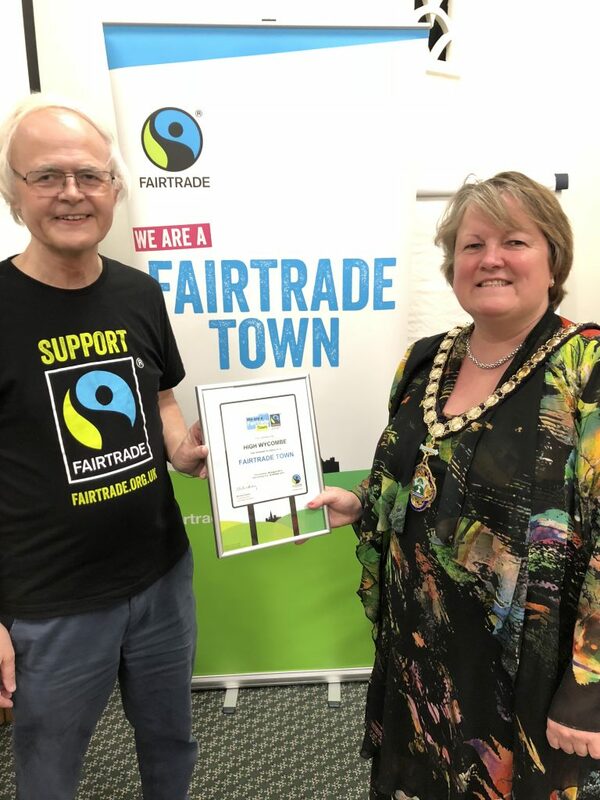 MK – It wasn’t mentioned at the Fairtrade conference (FT) in London a few weeks ago and so Bill Dykes raised it with Mike Gadney of the FT organisation at the conference. Someone from Divine then announced it at the conference but nothing was said by the FT Foundation. MK – Wycombe Friends of the Earth are showing a film on 20th Nov ‘A Plastics Ocean’. MK – Bucks New University have lost Starbucks from the franchise at Wycombe campus and replaced it with Costa but they do sell ‘Grumpy Mule’ coffee which is triple certified and still have fruit juice and snack bars etc. from Bewleys. MK – Re: Ideas for FT Fortnight. JM – Has heard that the big topic will be the production of cocoa and issues with producers in the Ivory Coast not receiving the living wage. SM – Hasn’t managed to contact Highcrest Academy yet but will do so and will offer that Louise from Bewleys could do a talk – maybe during FT Fortnight. MK – Or at World Fair Trade Day in May 2019. JM – Would be good to promote a link with producers during FT Fortnight. Perhaps use Wycombe Sound? MK – Re: The international conference in Madrid. We had the largest contingent from one town (MK/SK/JM). There was an excellent speaker from America representing the FT Universities (these have more prominence than FT towns in America). One Canadian university had students who set up a direct link with a producer group in Latin America which produced a coffee, unique to the university. JM – There were representatives from an FT town from Costa Rica. They obtained support from their mayor and council. MK – There were about 3000 producers in the Costa Rica Cooperative. MK/SK/JM spoke to the CEO of the international FT organisation. He is trying to change the models of how FT and trade in general work. They are looking at ‘solidarity’ models – putting people first, environment second and profit third. Another good session was from the FT advocacy office in Brussels (Sergei). Difficulties with corruption were also discussed. The FT Towns conference in 2019 is possibly in Cardiff. SM – Will scan the Madrid conference programme and email it around. MK – Spoke to people from Tibasosa (a town in Colombia) – they are trying to become an FT town and they produce FT artisan handicrafts. MK felt that they made lots of contacts. 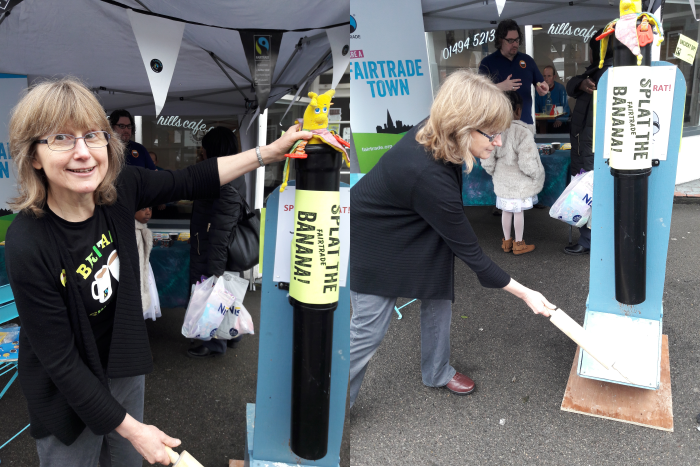 People who were there also included Bruce Crowther, Isobul Durant from Unctad and Merline Presin from The Latin American and Caribbean Network of Fair Trade Small Producers and Workers (CLAC). MK will write up some of the sessions and put them on our website. Perhaps have one section on the organisations and one section on producers. SK – There was a good slogan: ‘From the town into the world and from the world into the town’. JM – There was also a talk about the international FT charter which was launched in Sept. The idea is to promote a new business model, as MK mentioned. MK – The charter incorporates the UN Sustainable Development Goals. JM will circulate further info on these towns. We could choose one to focus on first and perhaps also concentrate on one or a few products. JM – A lady from Bristol said they have set up a ‘Community Interest Company’ and it means they can receive funding from local government or the Co-op. Next meeting: Tuesday 27th November, Hills Cafe, Micklefield. This entry was posted in Steering Grp Mtg Notes on November 13, 2018 by Mike King. MK – Christ the Servant King church has awarded us another £250 grant from their Mission fund. The previous amount of £250 that they gave us was extremely useful. MK thinks we shouldn’t use it to buy provisions for the renewal presentation event. MK – has sent e-mails to Wycombe Swan, Wycombe Wanderers and Bewleys. Has now heard back from Louise Whitaker (Sustainability Manager) at Bewleys – they are not planning to have any speakers who are producers but she is currently visiting coffee producers in Nicaragua and is willing to do a talk about it for us. MK has invited her to our presentation evening and asked her to speak for 5 mins (22nd February). MK – has also written to Mid-Counties Co-op to ask for a discount on FT wine. JM – recently went to Bolivia and visited 3 Co-operatives, 2 of which he visited 3 years ago. He also visited a brazil nut factory. Last year, there was the lowest production of brazil nuts since the beginning of the last century. Seems to be due to climate change. There is insufficient rain, a lack of bees and deforestation. In the 18th century rubber was a big product and was then superseded by artificial rubber. JM witnessed how the FT premium is being used – for improving houses and saving money to be used for improving healthcare. JM has written 2 blogs about this and will be putting it on our Facebook page. The management of co-operatives is not so well organised in Bolivia, so these may not be a good option for partnering with. Nicaragua would be better. They did have problems in the late 70s / 80s due to fighting involving the Sandinistas. JM knows the president of the co-operative in Nicaragua. JM is going to start working with Liberation at the end of Feb / beginning of March but is also doing some work helping out the Twin Partnership (coffee). MK – has updated our directory to add Highcrest Academy as having FairAware status and Godstowe as FT Registered status. Has also updated the date on the front to 2018 – 2019. MK – asks us to send any comments re: the websites before his meeting with TT on 24/01/18. TT – we can’t with the present set-up which is hosted by the Lib Dem site but it would be possible if we had our own stand-alone site. To do this, we would have to pay for it to be hosted elsewhere (about £3 per month). SM – if the Wycombe Tourist Info office has a website, we could ask them to put a link on it to our new website. MK – the meeting with Suzanne Brown didn’t come about in the end – perhaps later in the year. MK – some other FT Towns offered an associate membership scheme (this would be another income stream). This entry was posted in Steering Grp Mtg Notes on March 12, 2018 by Mike King.